On last night’s episode of The Walking Dead, it seemed as though not much had happened, except that the people in the prison are getting sicker and sicker and there doesn’t seem to be a way to stop the spread of contagion. A quarantine is put into place, but segregation isn’t going to heal the sick – these people need medicine. Daryl takes a group on a mission to get the necessary meds, but it’s a far ride and there’s lots of Walkers between their prison home and the veterinary college that hopefully has what they need. 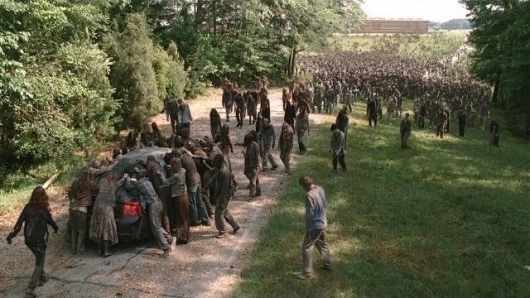 During New York Comic-Con earlier this month, we got a sneak peek from this episode of the scene where Daryl and co are in a car driving and encounter a massive herd of Walkers. AMC has released this clip from Episode 4.3 “Isolation” online and you can watch it here below. I’ve also included two behind-the-scenes/making-of videos for the episode. And, obviously, SPOILERS for the videos here below.